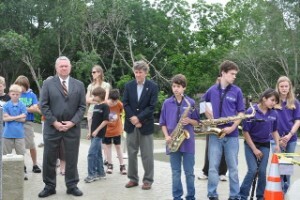 May 25, 2010, 10 am, a memorable event was held at the ‘Pond’ located between Great Northern and Shoal Creek Blvd. It was just a big ditch that filled with water, but now it is an attractive detention pond for water run off complete with spillway to help prevent Shoal Creek from causing another flood disaster. The purpose of the upgrades was to prevent the dam from failing. The City did not add to the capacity of the dam however, so the work has not altered the floodplain. 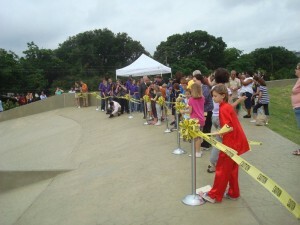 There is a walkway around the pond, a great place for dogs to run, ride bikes, walk, jog. We have our own local dinosaur, the plesiosaur. 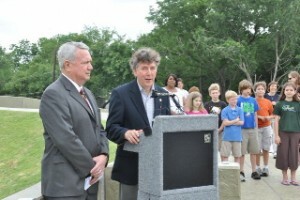 Mayor Lee Leffingwell and Representative Elliott Naishtat spoke on the importance of this project to the neighborhood and led the group that cut the ribbon. A highlight of the event was the performance by the Lamar Middle School pep band who entertained with their program of songs. 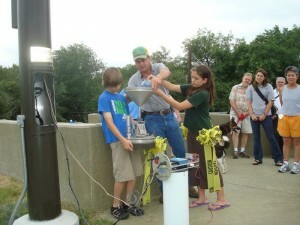 The Gullett Go Green Club participated in the ribbon cutting and in the demonstration of the flood warning gage given by Carl Cannon. Paul Yura, the Warning Coordination Meteorologist for the National Weather Service talked about the 1981 Memorial Day Flood citing the amount of rain we had in a very short period of time and how this facility will prevent this from happening again. Director Victoria Li of the City of Austin Watershed Protection Department, presented some history of the project as did Howard Lazarus, Acting Assistant City Manager, on how the City and the neighborhood worked together for the extras to make this pond a showcase. 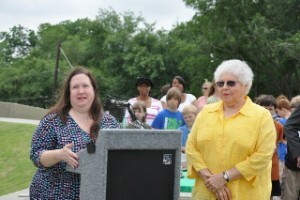 ANA President Donna Beth McCormick and Parks and Beautification Chair, Linnea Lemon thanked the City for working with the neighborhood in making this a very functioning facility. Allandale neighbors – be sure and take advantage of this great facility. There is a bench to sit and read, watch the dogs run, or watch the birds.